Ok – this recipe is how I’ve been fixing carrots for the kids where I work. This preparation gives carrottts an exotic, spicy, sweet, savory kind of vibe. I really love carrots fixed this way, and I’m not a carrot lover. The kids eat them (more or less) too! It reminds me of sweet potatoes, but I know they’re carrots. 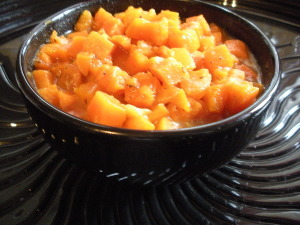 My recommendation, if you don’t serve sweet potatoes in some form for your holiday dinner table, try curried carrots. You’ll get the color and some of the flavor! Different and delicious! Bring 1 pint of water to a boil and add frozen diced carrots. Turn flame down to medium and allow carrots to cook five to 7 minutes. Add seasoning and butter. Stir well. Turn flame down to simmer. Allow to simmer 10 minutes Serve.